Part of me just loves this salad because of the spectacular colour of the ingredients, it is however not all looks here, the flavours are great too. This salad makes a lovely addition to a festive or celebratory meal, like a stained glass window it seems to glow with mystical light. The flavour of the salad is both light and full of depth - don't be alarmed by the lack of cheese or carbohydrates, even for me this salad is man enough on his own! Being a devoted history buff, there is something particularly special for me about using pomegranates, which is why they crop up here from time to time. Pomegranates have been used in cooking for thousands of years – known as the Punic Apple to the Romans – it has been a cherished ingredient for peoples from Persia to China and everywhere in between. Studying art history, I often found myself dissecting and interpreting the intricate patterns of William Morris, or indeed Renaissance tapestries– many of which used the royal symbolism of the pomegranate with the royal or virtuous symbols of other plants and flowers such as cornflowers, roses, ivy and lilies – all my personal favourites. I could write for hours on that, but this is not the time nor place, we are here to cook, ergo to eat! This recipe, although only using one chicken breast is ample for 2-3 people as a light lunch or for 4 entrées, if serving for four people as a main increase the chicken to two breasts. Note: as there is raw onion and thyme in this salad, the lettuce should not be too bitter or fighty, but a mixture of rocket and mignonette would work well. To make the dressing, add the saffron and honey to about a tablespoon of warm water and leave to infuse for a few minutes. Whisk in the vinegar and olive oil with a pinch of salt and the thyme, and lemon juice. Set aside – the flavour and colour will develop as you prepare the salad. Butterfly the chicken breast so that it is thin enough to cook swiftly – about 1cm thick. Sprinkle over a little salt and pepper, just enough salt to assist with caramelisation. On a very hot grill, cook the chicken breast, allowing it to chargrill and develop deep caramelised grill lines. While cooking the chicken, add the reserved half a lime to the grill and allow it to chargill, leaking its juices into the chicken. Once the chicken is cooked through, set aside covered with foil and leave to rest for at least 3 minutes. Once rested, slice into generous pieces. On a serving platter, spread over the lettuce and the segmented lime. Cut the onion into shards and scatter over the lettuce. Next, lay the mango over the top of the lettuce then add the chicken. 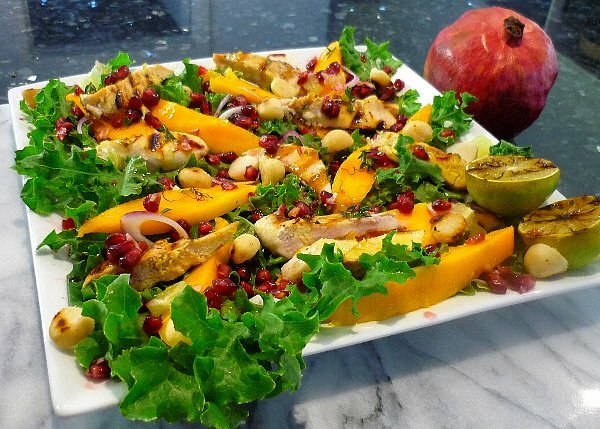 Cut your pomegranate in half and using a heavy spoon, bang the seeds out over the salad. Lastly, add the dressing, carefully spooning it over the chicken then sprinkle over the toasted macadamias. Serve with and squeeze over the grilled lime just before eating. This makes an ideal light main meal, a lovely summery entrée or as part of a greater feast.